Whether you are rearranging your storeroom or doing a complete relocation, moving is one of the most stressful times in a storeroom. Murphy’s Law seems to come into play at every turn and the chaos can seem overwhelming. With all of the activity there is a constant opportunity for lost or misplaced parts, which will result in lost money and downtime. 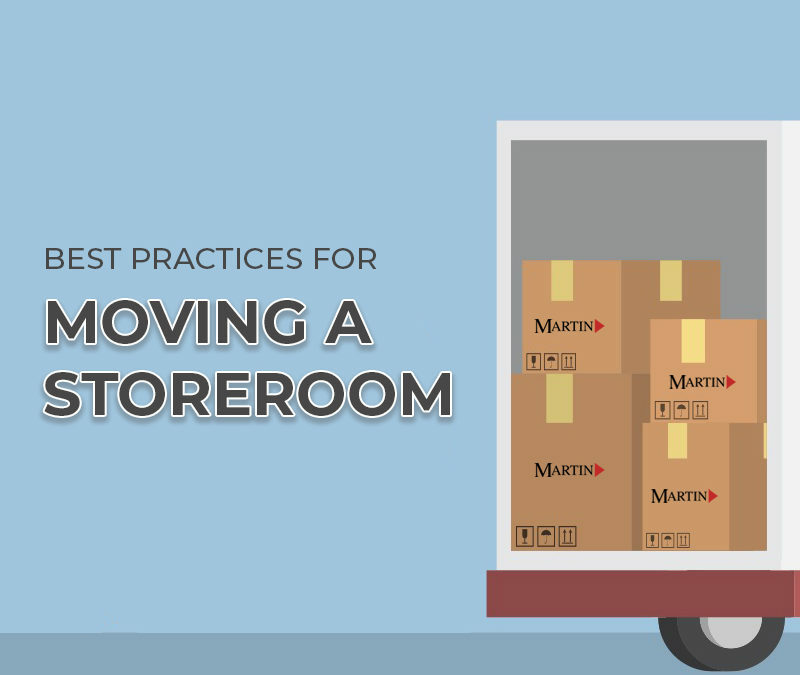 By following these tips and guidelines from Martin Supply, your storeroom can proceed stress free. The most important thing to do for a storeroom move is to plan. That doesn’t mean just plan when the move should occur, plan each and every step that will be taken. The first step in planning is to identify the scope. This involves knowing how many parts will move, where they are moving to, and your timeline. Needing to move in one day will look much different than a move that can occur over a few weeks. The planning process should also involve more than just the storeroom personnel. The storeroom is the hub for MRO materials in a plant, and every department is at least indirectly affected. Make sure that decision makers from maintenance, production, and even finance are involved so that they can provide input and be aware of what is going on. This ensures that come moving time the outside surprises are minimized. As you plan the move, data analysis should be performed so that you are making the best layout for your new home. Whether you do the layout yourself or you have a professional do it, it is critical that the new storeroom be laid out logically and with the right items in the right place. Regardless of why the move needs to occur, it is an opportunity to maximize the efficiency of the storeroom, so be sure to take advantage. While this is a part of the planning process, it deserves its own section. Communication is vitally important when it comes to moving parts, because the internal customers in the plant need to be informed what’s going on and have an opportunity to plan accordingly. Best practice is to send out a periodic update leading up to the event, then communicate daily with supervisors and plant leadership while the move is ongoing. This will help control expectations and ensure that each department is able to take any necessary steps to maintain normal levels of productivity. Once the plan is made and the move is communicated, moving day finally arrives. Here is a list of tips and processes to do for the best possible outcome. Assemble and pre-label the entire new storeroom – If you are not using the same shelves/cabinets, this will provide you with an opportunity to see your new setup and make sure everything is in order. Also, doing this before any moving occurs will mean a faster move with less opportunity for mistakes. If you are using the same shelves/cabinets, make sure you have a detailed map drawn out to help the move. Kit as much as you can – Part of your communication with other departments will revolve around what they need. Go ahead and provide PPE and other common use parts to production so that their basic needs will be taken care of. Unless you move during a shutdown it’s inevitable that some parts will be needed mid-move, but kitting will help reduce that foot traffic. Specialize jobs if possible – It’s best to have multiple teams working in specialized jobs rather than work in mass. So have a team working in the old storeroom pulling parts, one driving forklift(s), and one in the new location unloading and re-locating. Relocate at every step – This may be our most important tip. When you move items off of the shelf and onto a pallet (or box, cart, or) to be moved, have the pallets numbered and go ahead and relocate the item to the pallet as soon as it is place on to it. DO NOT WAIT! Then, once it is in the new location, relocate it to the new bin location immediately. The easiest way that items get lost is from not relocating, so be extra diligent here. Move in complete sections, and when the items have all been relocated to their new location, run a report for the old bin location and the pallet. If there is any part still showing on either one find it then, and not at the end of the move when you will have the entire new storeroom to hunt through. Frequently check your data integrity to guarantee that it is clean. 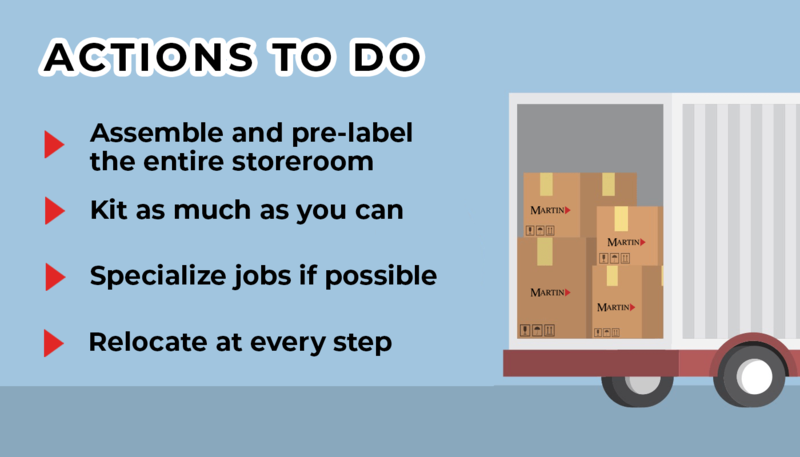 By following these tips and steps you will maximize your chances of moving your storeroom without a hitch. But, if you need additional support, manpower, or expertise, Martin is ready with specialist who can complete this process for you. Contact your Martin Rep Today and ask to learn more about how we can offer a custom tailored solution to make your storeroom move a breeze.